No matter at what age you get married, the feeling of getting a sharer and a life partner is phenomenal. I guess nobody can replace this kind of warmth and special feeling because it is a blessing to have a soul mate with whom you can share your sorrows, your agonies, your dreams and hopes, your fantasies, your bittersweet realities. Your thoughts & feelings and everything one might think of. It is good to have a person than to die alone because people do not die out of depression or sickness but they die out of loneliness. Same is the case when you make friends with new people. They do your catharsis, you have a quiet corner to sob, you have shoulders to cry on, you have people to laugh with. Yes, this is what we call living a life. It so happens that when you are single you terribly want to be in a relationship but when you are in a relationship you don’t want to be caught up or caged like a bird with no wings. Somehow it also is a restricted and reserved relationship where you are answerable to your partner, about what and how you have been doing a thing. The many mouths the many different views, but this holy relationship should be celebrated every day. If you are looking up for a partner for yourself I wish and pray that may you get the best out of all, because it is a matter of a lifetime and not just a contract for few months. It is about understanding the other one, and respecting the differences, it is about avoiding the arguments and sorting out things between the two rather than washing the dirty laundry in the public. Marriage is a beautiful bond between the two people that changes everything. The life before and after is immensely changed. Let us know about your favorite marriage and couple quotes and experiences, it will be interesting to read them out. 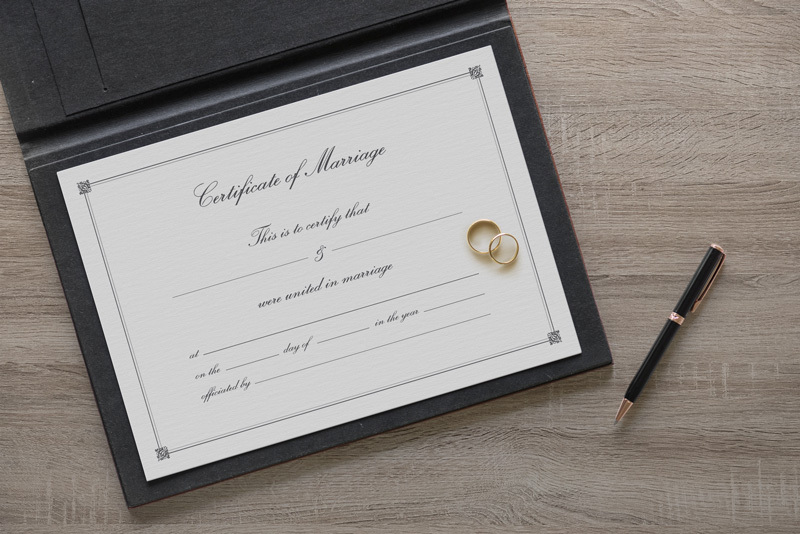 Coming towards my today’s post which is highlighting a free marriage certificate template & mockup psd. You can insert in names, dates and details to use it as a presentation before your client. Also it will give you ideas that how a wedding certificate can be built up.